· Automatic GPS positioning system for precise positioning. · Perfect image transmission property with 200 transfer distance to cell phone. · Comes with LED light, allowing safe flight at night. 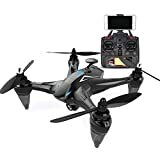 · Description: Item type: Quadcopter RC Take-off weight: 0-250 g (not included) Features: 5G Follow the function configured GPS high return to return Maximum flight altitude: over 120 meters (not included) Channel: 6 channels Material: ABS Color: 720P (red), 720P (blue), 1080P (red), 1080P (blue) Remote control distance: 450 m Features - High quality material - HD camera - Perfect image transmission property Package includes: 1 x GW198 GPS RC Drone 1 x Transmitter 1 x 7.4V 2000mAh Battery (inside the drone) 1 x USB Cable 1 x English Manual Notes: There may be a 1-2 cm error due to manual measurements, please kindly understand. Color deviation may differ due to different monitor settings. We provide you with the best product and service. If you have any problems, please let us know and we will resolve the issue as soon as possible. Thank you very much.